A new technique to separate cloud and non-hydrometeor returns from a cloud radar high-resolution reflectivity measurements is proposed. The TEST algorithm potentially identifies cloud height with the theoretical echo sensitivity curves and observed echo statistics for the cloud height tracing. TEST is more robust in identifying and filtering out the biota contributions by constraining further with spectral width and LDR measurements. This algorithm improves the monsoon cloud characterization. The effect of atmospheric aerosols on cloud properties is not very well understood in the Indian region, especially over Western Ghats, which is influenced by natural and anthropogenic aerosols. Collocated measurements of aerosol and cloud properties were used to estimate aerosol indirect effects using two methods: one with cloud drop number concentration and the other with cloud droplet size. Discrepancy between both methods is discussed, and the necessity of dispersion offset is emphasized. Rainfall estimates from commercial microwave links were obtained for the city of Sao Paulo (Brazil). The results show the potential of such networks as complementary rainfall measurements for more robust networks (e.g. radars, gauges, satellites). We compare the two-cornered hat (2CH) and three-cornered hat (3CH) method for estimating the error variances of two or more independent data sets using simulated data with various error correlations and biases. We assess the accuracy of the 3CH and 2CH estimates and examine the sensitivity of the estimated error variances to the degree of error correlation between the data sets as well as sample size. The 3CH method is less sensitive to these factors and hence more accurate. Turbulence within the atmospheric boundary layer is critically important to transfer heat, momentum, and moisture. Currently, improved turbulence parametrizations are crucially needed to refine the accuracy of model results at fine horizontal scales. 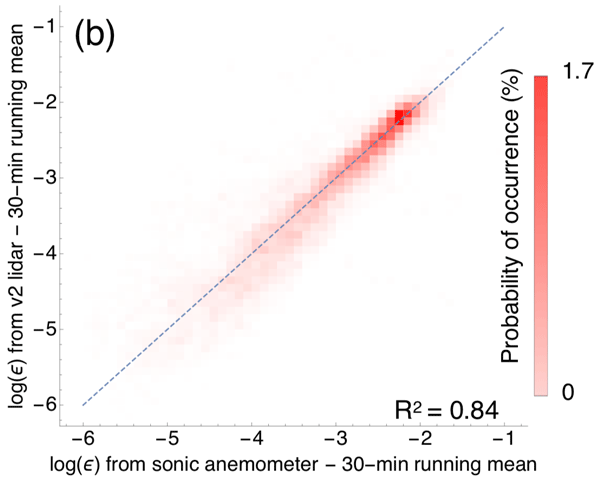 In this study, we calculate turbulence dissipation rate from sonic anemometers and discuss a novel approach to derive turbulence dissipation from profiling lidar measurements. We analysed observations of the Moon with the Advanced Microwave Sounding Unit-B on the NOAA-16 satellite in order to search for bias in the sounding channels. Significant bias had been detected in the past on the basis of simultaneous nadir overpasses. With the Moon providing a quite different reference flux than the on-board calibration target and Earth scenes, radio-frequency interference emerged as the best explanation for the anomalies of channel 20 of AMSU-B on NOAA-16. 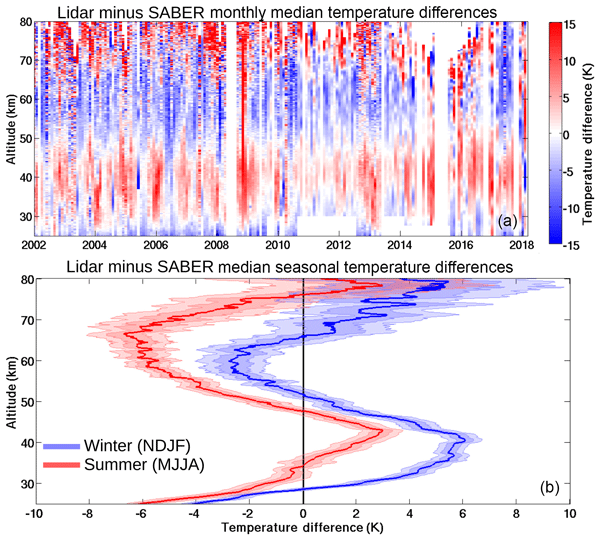 This work presents a polarimetric forward operator for the COSMO weather prediction model. 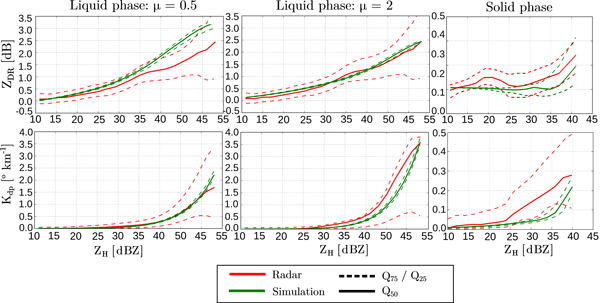 This tool is able to simulate radar observables from the state of the atmosphere simulated by the model, taking into account most physical aspects of radar beam propagation and backscattering. This operator was validated with a large dataset of radar observations from several instruments and it was shown that is able to simulate a realistic radar signature in liquid precipitation. Water vapor is the most important tropospheric greenhouse gas and is also highly variable in space and time. We study the vertical structure and variability of tropospheric humidity using various observing techniques (GPS radio occultation, radiosondes, Atmospheric Infrared Sounder) and models. Time–height cross sections reveal seasonal biases for different pressure layers. 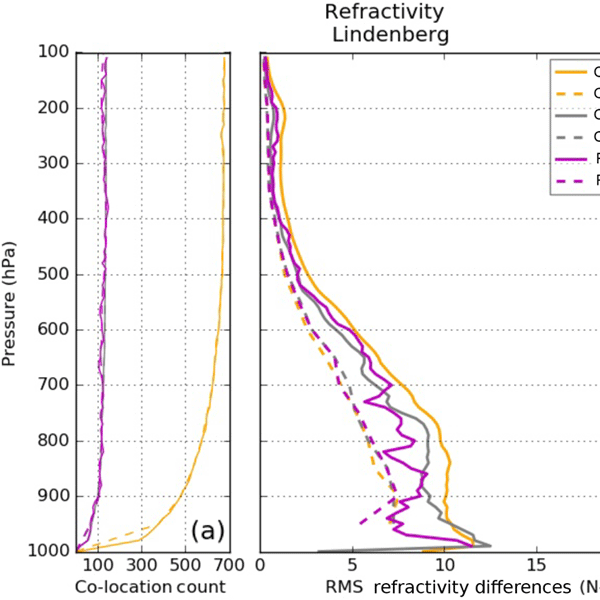 We find that radio occultation humidity has high accuracy and can contribute valuable information in data assimilation. Comparing observational systems when observations are not taken at the exact same time or location can introduce sampling errors that can be come significant during error analysis. In this study, we develop two methods to reduce sampling errors: using ellipse distance constraints rather than circles and subtracting model background. We found that both the ellipses and subtracting model background from the observations reduce sampling errors caused by spatial and temporal differences. Atmospheric observations from GPS receiver satellites offer uniform spatial coverage over the Arctic. The GPS profiles sensing deep into the lowest 300 m of the atmosphere only reach 50–60 % in summer but over 70 % in other seasons. The profile uncertainty due to different data centers is within 0.07 % in refractivity, 0.72 K in temperature, and 0.05 g kg-1 in humidity below 10 km. A systematic negative bias of 1 % in refractivity below 2 km is only seen in the summer due to moisture impact. The intent of this research paper is to rigorously validate the performance of satellite rainfall products to be used for various operational applications in data-scarce regions of the Upper Blue Nile (UBN) basin in Ethiopia. It was found that satellite rainfall products could be used as an alternative source of rainfall data in areas with no or poor ground observations. Their reliable performance could make more appropriate for various functions in complex topographic areas of the UBN basin. Latent heat fluxes (LHF) play a major role in the climate system. Over open ocean, they are increasingly observed by satellite instruments. 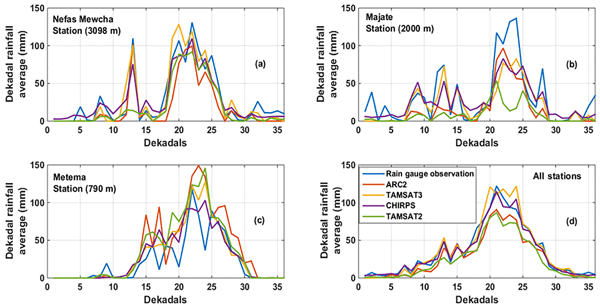 To access their quality, this research focuses on thorough uncertainty analysis of all LHF-related variables of the HOAPS satellite climatology, in parts making use of novel analysis approaches. 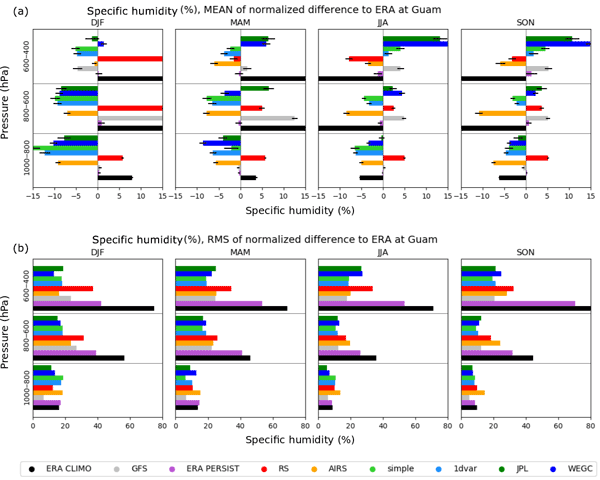 Results indicate climatological LHF uncertainies up to 50 W m−2, whereby underlying specific humidities tend to be more uncertain than contributing wind speeds. This study cross-compares the 10-year record of GPS radio occultation (GPS-RO) specific humidity product against independent databases (e.g., AIRS satellite, NASA/MERRA, and ERA-Interim). Our objective is to investigate the suitability of the GPS-RO humidity as a climate variable, which the science community could use in climate research. GPS-RO offers high vertical resolution, low sensitivity to clouds, and long-term stability making GPS-RO humidity a valuable complementary data set. The GPS signal going through the atmosphere will experience refraction or bending, which can be precisely measured and used to infer the atmospheric properties. This paper demonstrates that high-quality atmospheric measurement with less than ~ 0.4 K is achievable from a GPS recording system with a simple antenna mounted on top of an aircraft cruising at ~ 13 km. Such a simple airborne GPS system can be implemented on commercial aircraft to provide valuable data for weather models in the future. We investigate stratospheric gravity wave observations by the Atmospheric InfraRed Sounder (AIRS) and the High Resolution Dynamics Limb Sounder (HIRDLS). Waves seen by AIRS contribute significantly to momentum flux, which indicates a calculated momentum flux factor. AIRS and HIRDLS agree well in the phase structure of the wave events and also in the seasonal and latitudinal patterns of gravity wave activity and can be used complementary to each other. This work is part of a project funded by the government of Spain, whose objective was to develop a methodology that would allow the grain size and heavy metals estimation in the sediments of the intertidal zone (Bay of Santander) and depth estimation in the subtidal area, using information (VNIR) captured by the hyperspectral sensor, CASI-2, a spectroradiometer ASD-FR (350–2500 nm) in field and laboratory and classical and robust statistic algorithms. Estimates of snowfall rate as derived from radar observations can suffer large uncertainties due to great natural variability in snowflake microphysical properties. We used in situ observations of particle size, shape, and fall speed to refine radar-based estimates of snowfall for five snow events at the ARM Barrow Climate Research Facility. Estimated snowfall amounts agreed well with nearby snow gauge observations and demonstrated significant sensitivity to both particle shape and fall speed. 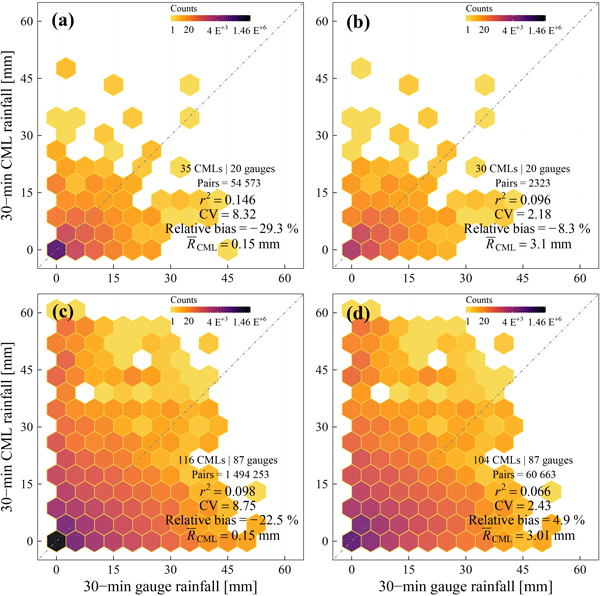 In this study, we used diagnostic methods to analyze the impact of data assimilation on the monthly precipitation distribution over the Tibetan Plateau and then focused on one heavy-rainfall case study that occurred from 3 to 6 July 2015. It is conspicuous that the ATMS assimilation showed better performance than the control experiment, conventional assimilation, and CrIS assimilation. Overall, the satellite data assimilation can enhance the WRF-ARW model’s ability to predict precipitation. An assessment of IIR radiances after 9.5 years of nearly continuous operation since June 2006 is presented. First, IIR is compared with similar MODIS or SEVIRI channels in various conditions. Second, clear sky measurements in each channel are compared with simulations. The first approach detects biases and/or trends, and the second approach contributes to identifying which channel deviates from the other. 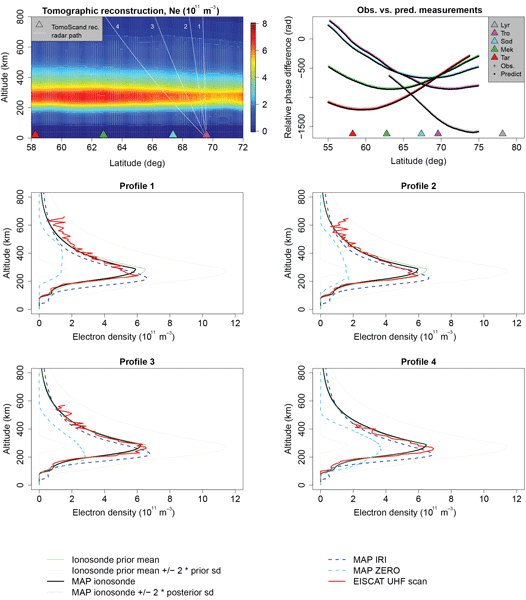 The analyses are based on simulations using the 4A/OP radiative transfer model. The XPIA experiment was conducted in 2015 at the Boulder Atmospheric Observatory to estimate capabilities of various remote-sensing techniques for the characterization of complex atmospheric flows. Among different tests, XPIA provided the unique opportunity to perform simultaneous virtual towers with Ka-band radars and scanning Doppler wind lidars. Wind speed and wind direction were assessed against lidar profilers and sonic anemometer data, highlighting a good accuracy of the data retrieved. The knowledge of the actual radiation pattern is crucial for the analysis of radar echoes and is also an important indicator of the radar's health status. The method described here allows the radiation pattern to be characterized by observing meteor head echoes. In contrast to previous studies we generate angular occurrence maps of meteor trajectory points for periods of normal and limited radar functionality to derive the radiation pattern and compare them thorough simulation results. Triple RHI scans were performed with three simultaneous scanning Doppler wind lidars and assessed with lidar profiler and sonic anemometer data. This test is part of the XPIA experiment. The scan strategy consists in two lidars performing co-planar RHI scans, while a third lidar measures the transversal velocity component. The results show that horizontal velocity and wind direction are measured with good accuracy, while the vertical velocity is typically measured with a significant error. Global coverage of remotely sensed skin temperature, along with cloud/surface radiation parameters, produced in near-real time and from historical satellite data, is beneficial for weather and climate purposes. One key drawback is the dependence on view angle. Therefore, this article serves to validate a global, satellite-based skin temperature product, while highlighting an empirically adjusted theoretical model of satellite LST angular anisotropy, and the benefits gained from its application. This paper discusses trade-offs among various wind measurement strategies using scanning Doppler lidars. It is found that the trade-off exists between being able to make highly precise point measurements versus covering large spatial extents. The highest measurement precision is achieved when multiple lidar systems make wind measurements at one point in space, while highest spatial coverage is achieved through using single lidar scanning measurements and using complex retrieval techniques. Launch of INSAT-3D carrying a multi-spectral imager by the ISRO made it possible to obtain profiles of temperature and water vapour over India with higher temporal and vertical resolutions. 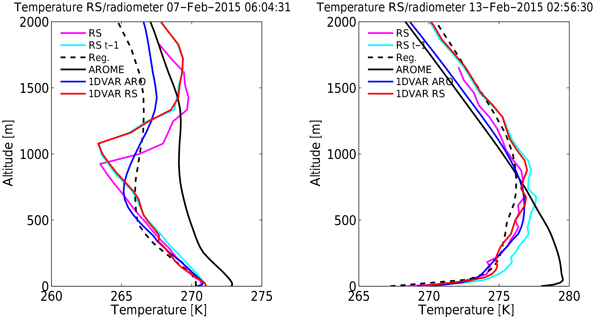 Initial validation is made with the radiosonde, other satellites and reanalysis data sets. Good correlation between INSAT-3D and in situ measurements is noticed with a few cautions. Temperature data from INSAT-3D are of high quality and can be directly assimilated for better forecasts over India. The upper-tropospheric humidity is an essential climate variable, which can be measured with microwave sounders in polar orbits. A stable photometric calibration of these instruments is indispensable for detecting long-term trends. We demonstrate that this can be achieved by using the Moon in a fixed phase as a flux standard for dedicated pitch maneuver observations. This method is particularly suited for future sensors with small beamwidths. 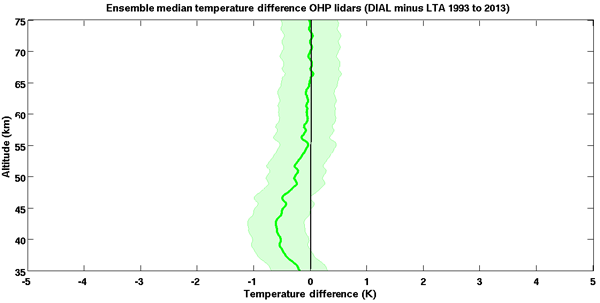 For the first time we are able to demonstrate that IASI-A and the AATSR retain their pre-launch characteristics (temperature dependence) in space. This has given tremendous confidence to the calibration community such as the Global Space-based Inter-Calibration system (15 nation consortium) who use IASI-A as an in-orbit reference to monitor their geo-stationary satellites. The multifrequency range imaging (RIM) capability of the Chung–Li VHF atmospheric radar is widely evaluated with long-term collected data. Effective corrections of range/time delay and range-weighting function effect for the radar echoes are achieved to improve the performance of RIM. The radar demonstrates its first successful observation of double-layer structures as well as their temporal and spatial variations with time. 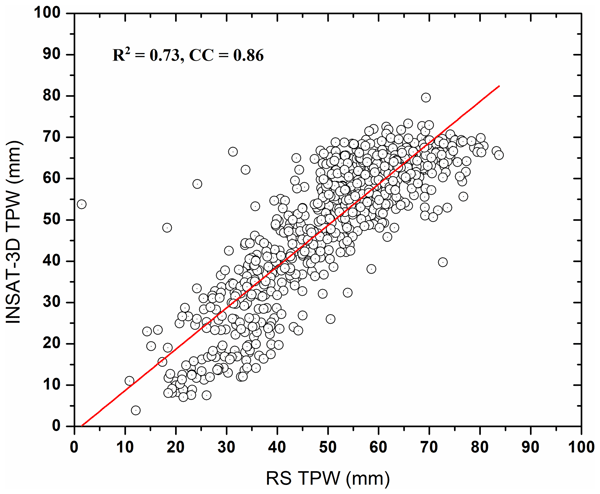 RIM results with and without significant precipitation are also shown. 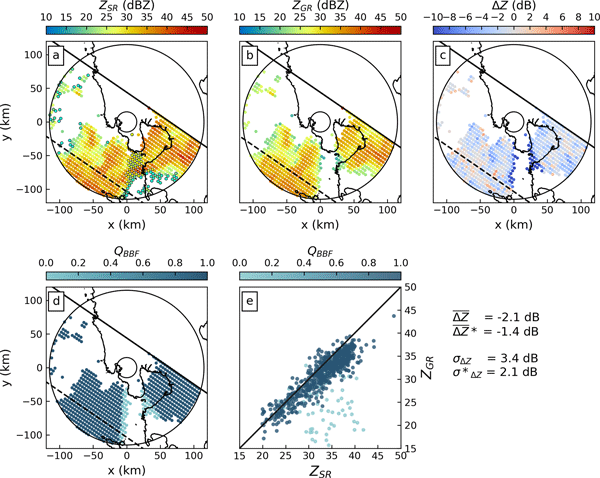 This paper proposed three methods for determining the reflectivity bias of single polarization radar using dual polarization radar reflectivity and disdrometer data (i.e., the equidistance line, overlapping area, and disdrometer methods), and we evaluated for two low-pressure rainfall events that occurred over the Korean Peninsula on 25 August 2014 and 8 September 2012. Overall, the most accurate rainfall estimates were obtained using the overlapping area method to correct radar reflectivity. Remote sensing devices known as lidars are often used to take measurements at potential wind farm sites. These instruments are however not optimized for measuring turbulence, small-scale changes in wind speed. In this manuscript, the impact of lidar configurations and atmospheric conditions on turbulence accuracy is explored. A new method was developed to correct lidar turbulence measurements and is described in detail such that other lidar users can apply it to their own instruments. Seven gravity-wave-resolving instruments (satellites, radiosondes and a meteor radar) are used to compare gravity-wave energy and vertical wavelength over the Southern Andes hotspot. Several conclusions are drawn, including that limb sounders and the radar show strong positive correlations. 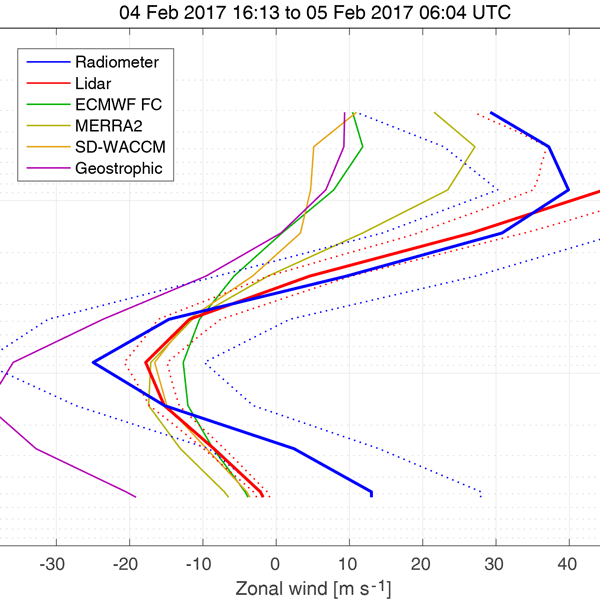 Radiosondes and AIRS weakly anticorrelate with other instruments and we see strong correlations with local stratospheric winds. Short-timescale variability is larger than the seasonal cycle. By modeling the Special Sensor Microwave Imager/Sounder's mesospheric measurements, inversions methods can be applied to retreive mesospheric temperatures. We compare the fast forward model used by Met Office with reference simulations and find that there is a reasonable agreement between both models and measurements. Thus we recommend that the fast model is used in data assimilation to improve mesospheric temperature retrievals. This paper provides a preliminary validation for the refractivity of GNOS, a new addition to the space-based radio occultation sounder on FY-3C. It possesses a similar sounding capability that COSMIC and GRAS did in the vertical range of 0-30 km, with a precision below 1 %.